14K YELLOW GOLD. 5 PT DIAMOND. 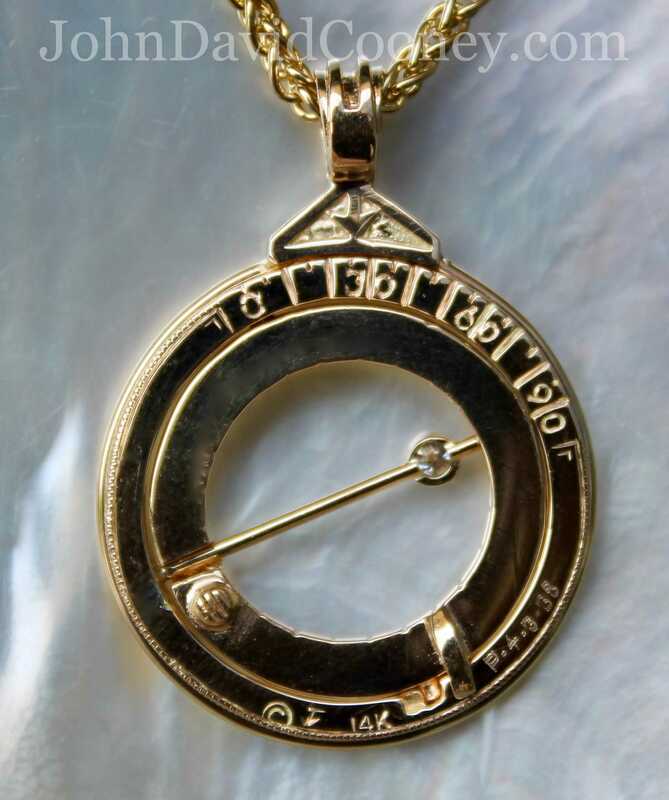 ASTRONOMICAL RING DIALS ARE ANCIENT TIMES PIECES WIDELY USED WELL INTO THE 18TH CENTURY. A GIFT TO GEORGE WASHINGTON FROM LAFAYETTE THESE DIALS ARE ACTUALLY MINIATURE FOLDING ARMILARY SPHERES A GLOBE OF THE WORLD CONSISTING OF RINGS REPRESENTING CONSTELLATIONS AND IMAGINARY CIRCLES AROUND THE EARTH. 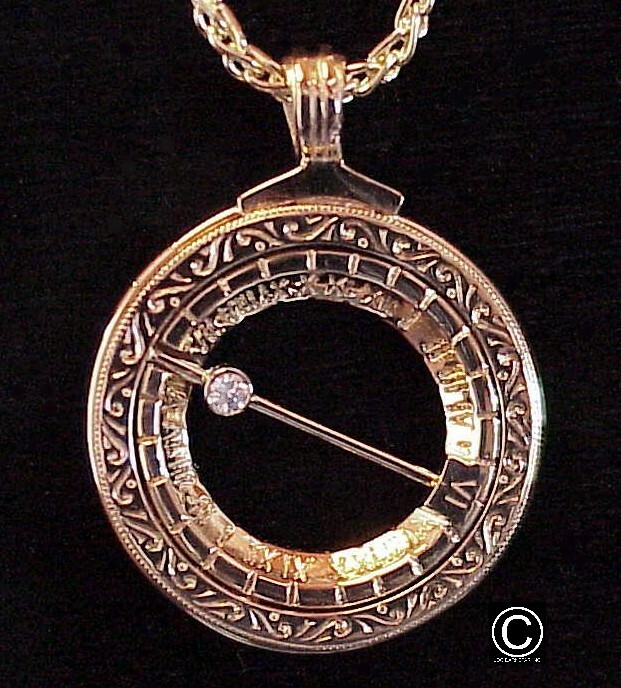 THE UNIVERSAL SUNDIAL, A DISTINCTIVE PENDANT HAS AN ADJUSTABLE LATITUDE THAT CAN BE SET NORTHERN LATITUDES AND GIVES SUN TIME WITHIN 15 MINUTES OF ACTUAL TIME. 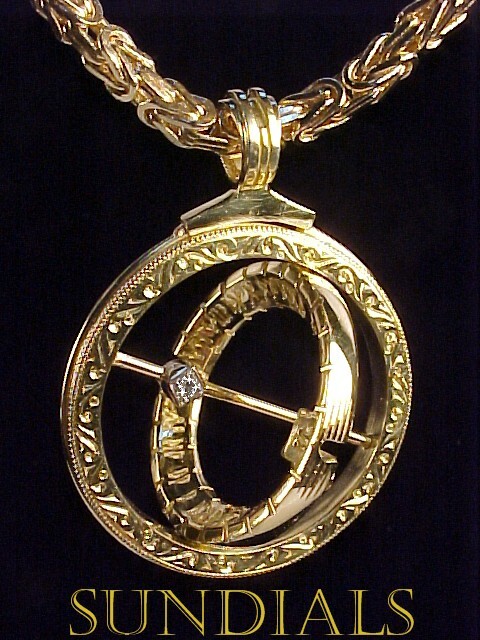 INNER DIAL HAS ROMAN NUMERALS, JUST LIKE A CLOCK. OUTER DIAL IS ENGRAVED WITH TRADITIONAL DESIGN WORK. BACK OF SUNDIAL . OUR UNIVERSAL DIAL HAS AN ADJUSTABLE LATITUDE FOR NORTHERN HEMISPHERE. THIS IS DONE BY HOLDING THE FACE OF THE DIAL AND SIMULTANEOUSLY ROTATING THE OUTER RING BY HOLDING THE BALE. ONCE YOU HAVE SET THE LATITUDE, OPEN THE INNER RING BY PRESSING ON THE BACK. POINT THE DIAMOND NORTH AND NOTE THE ROMAN NUMERAL WHERE THE SHADOW IS CAST ON THE INNER DIAL.